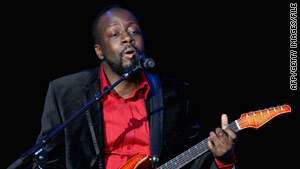 Wyclef Jean immigrated to America from Haiti when he was 9, and returned to help earthquake recovery efforts. The Grammy Award-winning musician and producer has set up a relief fund for earthquake victims in Haiti and has returned to his native country. He was born there in 1972. His family moved to Brooklyn, New York, when he was 9 and later to New Jersey. Jean wrote that he was concerned by the disturbing conditions in Haiti: "The majority of its 8 million residents live on less than $1 per day. Unemployment is close to 80 percent, and more than half the population is under 21 years old. Haiti is the poorest nation in the Western Hemisphere." In 2005, Jean founded Yéle Haiti, and according to its Web site, the "grassroots movement builds global awareness for Haiti while helping to transform the country through programs in education, sports, the arts and environment." The word "Yéle" was coined by Wyclef in a song and means "a cry for freedom." To donate $5 to the Yéle Haiti Earthquake Fund, text "Yéle" to 501501 (the amount will be charged to the person's cell phone bill) or visit Yele.org and click "Donate." A large list of international aid organizations can be found on the Impact Your World page at CNN.com. The 7.0 earthquake yesterday destroyed much of Haiti's capital Port-au-Prince. The BBC reports that Raymond Joseph, Haiti's ambassador to the United States, said that President Préval and his wife survived. Préval, 67, has been in office since May 2006. He held the same position between 1996 and 2001. When he took office in 1996, he became only the second democratically elected head of state in the country's 200-year history. In a profile, The New York Times called him a president with the daunting task of "trying to lead a country that historically has been the poorest and most blatantly misruled in the hemisphere." The haitielection2005.com Web site tells this story of a man who has been forced twice from his country. As a young man in 1963 Préval left Haiti with his family after they were targeted by dictator Francois "Papa Doc" Duvalier. During that exile, he spent five years in Brooklyn, New York, and returned to Haiti in 1975. He served as Prime Minister in the administration of President Jean-Bertrand Aristide from February 1991 until a military coup caused him to seek refuge at the French and Mexican Embassies in Port-au-Prince. He joined the exiled Constitutional Government in Washington from 1992 -1994. The chairman of the board and CEO of Goldman Sachs will appear in Washington today before the first public hearing of the Financial Crisis Inquiry Commission, the bipartisan, 10-member panel established by Congress to examine the causes of the financial crisis. The Commission will hear testimony on the causes and the current state of the crisis from top leaders of both the private and public sectors. Blankfein is in the first group of bankers to testify, and he's likely to face tough questioning. CNNMoney.com reports that after losing more than $3 billion in the last four months of 2008, the securities firm is on track to lavish some $21 billion on its workers for 2009, now that the firm has returned to profitability. That's in line with the amount Goldman paid in its record profit year of 2007. In November, Blankfein said in an interview with The Sunday Times that people were angry with bankers, but should be happy with them. '"We're very important," he said. "We help companies to grow by helping them to raise capital. Companies that grow create wealth. This, in turn, allows people to have jobs that create more growth and more wealth. We have a social purpose.'" Blankfein also made the now often-quoted remark that bankers do "God's work." The chairman of the Financial Crisis Inquiry Commission said he's interested in hearing about the banks' role in creating the crisis as well as finding out how they became "too big to fail." CNNMoney.com reports that the federal government stepped in to prop up the banks in fall 2008, creating the Troubled Asset Relief Program to help provide them with liquidity. "We think it made sense to start by bringing up the four biggest investment banks that were involved in so many aspects of the crisis," said Angelides, former California state treasurer, who warned about financial sector abuses back in 2002. "Many of them had arms that were involved in originating mortgages, some were packaging mortgage securities and some of them were betting against these mortgage securities." The commission has new offices in downtown Washington, a few blocks northeast of the White House. Funded to the tune of $8 million, it aims to employ between 40 and 50 investigators and other staffers. Angelides said he expects the tone of the hearings to be "professional" but also "tough, thorough and fair." "There's a real hunger among the people of this country to know what happened. We're not out to get anyone. We're out to get to the bottom of what happened as best we can." The former director of the New York Public Libraries will be sworn in today as the 10th Archivist of the United States. He'll be responsible for the billions of records saved by the National Archives, which includes the Declaration of Independence, the Constitution and the Bill of Rights. According to its Web site, the National Archives "keeps only those Federal records that are judged to have continuing value -- about 2 to 5 percent of those generated in any given year. By now, they add up to a formidable number, diverse in form as well as in content." There are approximately 9 billion pages of textual records; 7.2 million maps, charts, and architectural drawings; more than 20 million still photographs; billions of machine-readable data sets; and more than 365,000 reels of film and 110,000 videotapes."